The US Federal Reserve delivered another interest-rate hike at its December monetary policy meeting, marking the fifth such move in its tightening series starting in December 2015. Chris Molumphy, Franklin Templeton Fixed Income Group CIO, offers his take on the market implications. He says that while rising rates may give some investors pause, in the grand scheme of things, US interest rates still remain quite low, and are only just returning to more “normalized” levels. As expected, at its December meeting the Federal Reserve (Fed) raised its benchmark interest rate, the fed funds rate, by 25 basis points to a range of 1.25% to 1.5%. Given a reasonably healthy economic backdrop in the United States, the Fed’s move was certainly not a surprise. The Fed’s own forecast had called for three interest-rate increases this year, and it delivered. The market had been dubious that the Fed would follow through with its intentions, and for a while—2016 in particular—it was right. But 2017 played out largely according to the Fed’s projections. Three points stood out to me as key takeaways. 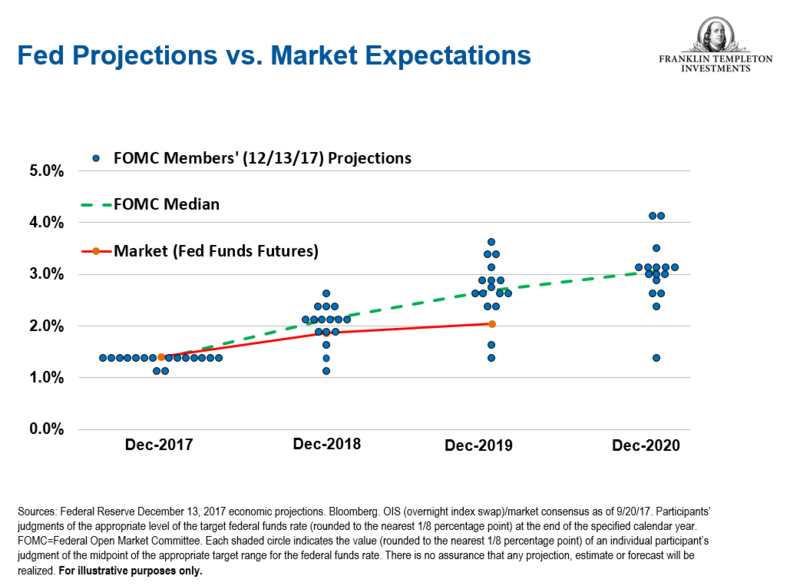 As we look ahead, the Fed has again forecast three more rate hikes in 2018, which you can see reflected in its latest “dot plot.” The market still remains slightly skeptical of the Fed’s forecast, but seems to be coming around a bit. Our view is that positive US fundamentals will indeed lead the Fed toward its planned path of reasonably moderate rate increases in 2018, with the emphasis on moderate. The Fed has put its terminal rate—the “neutral” rate at which it will stop tightening—at 2.75%, which was recently lowered from an earlier median target of 3%. It’s important to note that the United States is still historically in a very low interest-rate environment, and frankly, keeping rates close to zero for a prolonged period really isn’t healthy. In our view, this tightening cycle actually represents a normalizing of rates. I would also note that while short-term interest rates are under the Fed’s control, fundamentals drive longer-term interest rates. And longer-term rates are also low. The 10-year Treasury is still close to where it was at the start the year, and given the fundamentals we see, we do not expect it to move all that much higher in 2018 either. Employment looks solid. Household wealth has been rising. Corporate health looks good with revenue and profitability growth suggesting a generally steady outlook. And, consumer and business sentiment have indicated a sense of optimism over economic prospects. Certainly, there are always unknowns that could derail the market—including geopolitical risks—but we generally see a continuation of a good story for financial assets broadly. There are a number of key issues that we believe will prove important in determining investment outcomes in 2018. Perhaps most important among these is inflation, given its status as a driver of US Fed policy, interest rates and other key variables. While persistently high core inflation could spur rates to climb faster than anticipated, we think the more likely scenario is a modest uptick in inflation, particularly over the coming year. We believe inflation has been persistently low as a consequence of several factors, primarily globalization and technology. Globalization has made a vast pool of labor available that has helped keep a lid on wage growth globally. At the same time, improvements in technology have resulted in the automation of various traditionally manual tasks. Along with inflation, the Fed’s efforts to reduce its balance sheet (even as it continues to hike short-term interest rates) also bear close watching. It is the first time anything of this scale has been attempted, so care must be taken by policymakers not to unintentionally trigger an adverse reaction. While the Fed has just started this normalization process, the European Central Bank has announced that it will continue buying assets for a longer period than originally planned (albeit at a reduced pace) while the Bank of Japan has continued its quantitative easing program unabated. Nonetheless, we think the Fed and other central banks have done a reasonably good job communicating their intentions to market participants, although we recognize they are still in the early stages of what promises to be a long campaign. 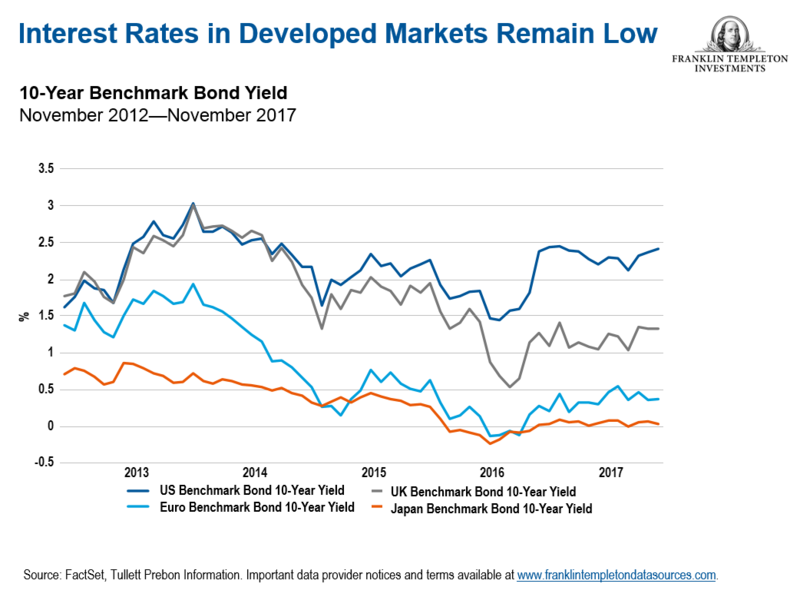 For these reasons, we reiterate that while interest rates are biased to rise, we think they are likely to do so at a generally measured pace over an extended period. We also remain cognizant of the age of the current economic cycle. This cycle is notable in the lack of excesses that normally accompany a late-stage cycle. For instance, we would expect somewhat higher levels of US inflation with unemployment at current levels, or somewhat higher levels of corporate leverage that could be interpreted as the first indications of excess. Overall, we are reasonably optimistic that this backdrop could remain intact over the coming year. At the same time, we cannot ignore the tremendous amount of liquidity that has been injected into the global financial system during the last decade, nor the view of many market participants that fixed income markets appeared fully valued on a number of traditional metrics as of late 2017. To get insights from Franklin Templeton Investments delivered to your inbox, subscribe to the Beyond Bulls & Bears blog. All investments involve risks, including possible loss of principal. Bond prices generally move in the opposite direction of interest rates. Thus, as prices of bonds in an investment portfolio adjust to a rise in interest rates, the value of the portfolio may decline. Changes in the financial strength of a bond issuer or in a bond’s credit rating may affect its value. Floating-rate loans and high-yield corporate bonds are rated below investment grade and are subject to greater risk of default, which could result in loss of principal—a risk that may be heightened in a slowing economy.